Your donation to LGEF has one purpose: fund additional teachers and staff at Los Gatos schools to ensure our children get the education they deserve. These teachers and staff are essential to "educating the whole child". These are positions that the state will not fund. Starting with the 2018-2019 school year LGEF will assume responsibility for funding all supplemental staff at all schools. More articles will be coming! ​For the 2017-2018 school year LGEF has granted a total of $550,000 for programs at our our schools. 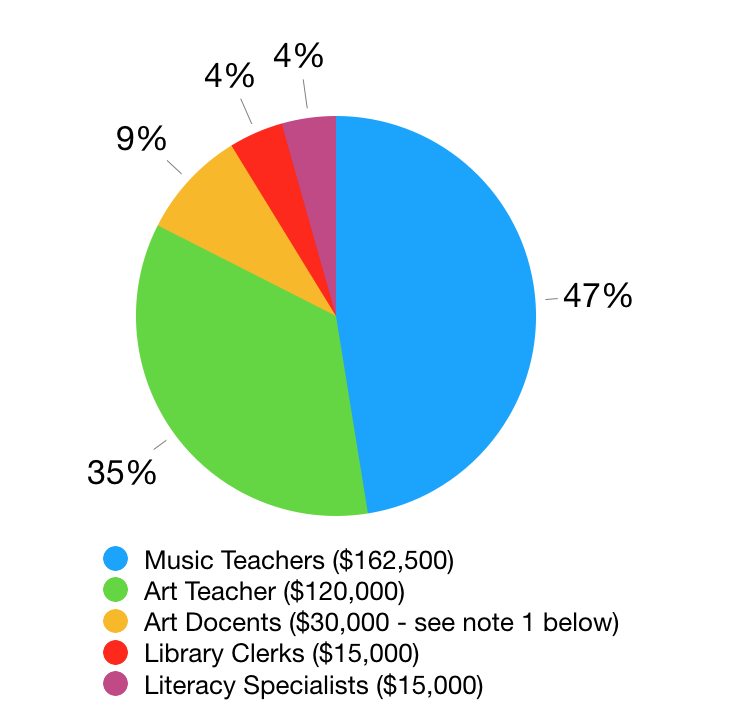 (1) Art Docents: In 2017-2018 LGEF granted a total of $40,000 to Art Docents of Los Gatos to provide Art instruction at all five schools; the split between elementary and middle schools is an estimate. Our Home & School Clubs bring together our school communities, inspire and coordinate volunteers, organize activites and events, and raise funds for many needs. Q: Should I support LGEF or my Home & School Club? A: ​Support both! It takes 2 great organizations to ensure a great education for our children. For 2017-2018, funding for these positions is split between LGEF and our Home & School Clubs. In 2018-2019, LGEF assumes full responsibility. For more information on how programs are funded this year and next year please select the link for your school. 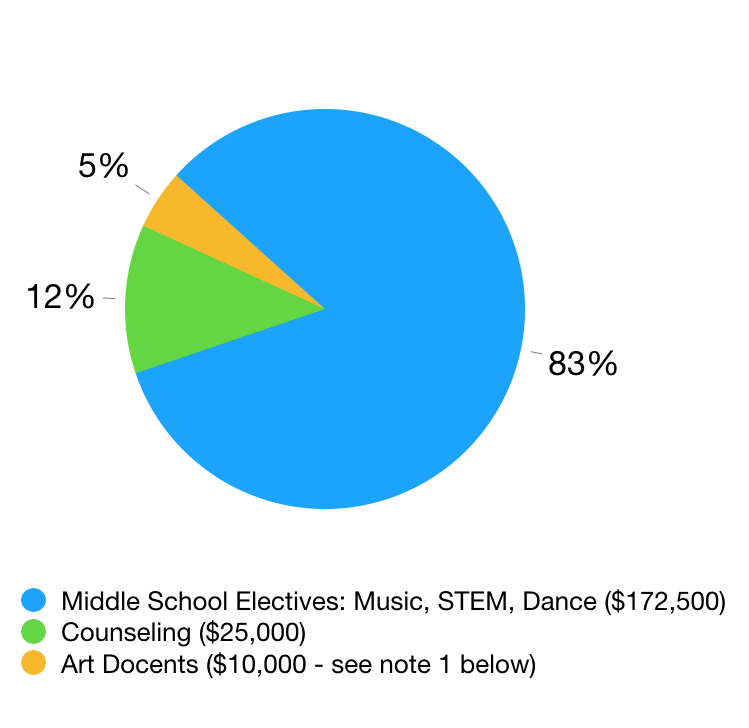 Starting in 2017-2018, your donation to LGEF is contributing towards the sixth grade middle school "wheel" at RJ Fisher including classes in STEM (coding), Dance, Art, and Skills for Adolescence. Read more about Middle School Counselors including photos and quotes. Our school libraries touch every child and are an essential part of the educational experience. For 2017-2018 LGEF is contributing towards library clerks for all four elementary schools. Literacy support for those students with need is an essential part of a well-rounded education. For 2017-2018 LGEF is contributing towards Literacy Specialists at all four elementary schools. This supplements funds raised by our Home & School Clubs. ​Read more about Elementary Literacy Specialists including photos and quotes. Art Docents of Los Gatos also offers multiple programs at Fisher middle school including: Art history in the French and Spanish classes, a two-part class on Scientific Illustrations as part of the science curriculum, and a Guest Artist program, where a professional artist comes to art classes to give an informative and inspiring talks. Each May Art Docents organize the LGUSD Annual Art Show (held at Fisher Middle School), a community event which displays more than 3000 pieces of elementary and Middle school student artwork.